The department offers a range of courses for native speakers (non-native speakers of English are advised to take the ESL writing sequence). The English curriculum includes remedial and preparatory courses in reading and writing; college-level composition and reading courses for transfer and associate degree students; and courses in creative writing and literature. The curriculum emphasizes the integration of reading and writing throughout its courses, reflecting the faculty's concern that students not divorce the study of language from the study of cultures nor lose sight of the uses or abuses of writing within a cultural context. The courses offered through the department meet general education and transfer requirements in English, critical thinking, literature, and humanities. Students majoring in English at the lower division level concentrate on learning how to interpret literature critically and imaginatively, and how to write prose that is clear, exact, and expressive. Thus the major is appropriate for students who desire or require the ability to be closely attentive to language and to its ramifications. Students anticipating careers in law, education, communications, governmental affairs, and business may find the English major especially helpful. The wide versatility of the English major makes it generally appropriate for students who career inclinations may be uncertain or indefinite, since the abilities one masters as an English major may be applied to a wide range of contexts and circumstances. The major is also designed for transfer students intending upper division study in literature, criticism, or related fields. 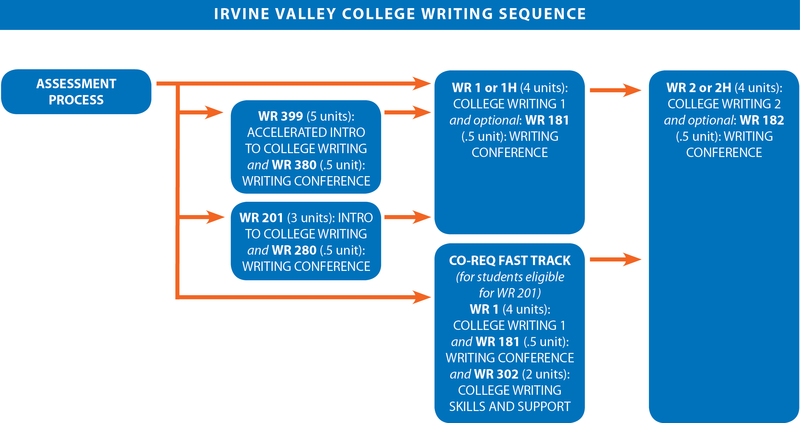 English majors at Irvine Valley College may elect an emphasis either in literature or in writing. In both cases, students should complete both Writing 1 and Writing 2 in fulfillment of language and rationality requirements within the general education package. The faculty recommends that English majors do not select a literature course to meet the humanities requirement for general education, but explore related subjects in the humanities that may be of interest to them. The curriculum emphasizes the integration of reading and writing throughout its courses reflecting the faculty's belief that the study of language includes the study of culture. English students examine a broad range of topics within composition, creative writing and literature. Upon completion of the Associate in Arts in English for Transfer (AA-T in English) students will be able to read, write, and think critically in producing essays and original work that demonstrates the craft of a given genre. Additionally, students will be able to interpret literary texts within their contexts, reflecting diversity in genre, historical period, and cultural expression. The proposed Associate in Arts in English for Transfer (AA-T) is designed to assist students in the seamless transferring to a CSU and complete a Bachelor Degree in English. Interpret literature critically and imaginatively, and respond in writing that is clear, exact, and expressive. Demonstrate through both speaking and writing how literature might embody and generate meaning, reflect and create culture, and engage the human imagination. Analyze the major types of literary expression as well as recurrent conventions, concerns, and values central to literature and to the understanding of literary texts and contexts. Possess knowledge of literary materials reflecting diversity in genre, historical period, and cultural expression. Possess knowledge of foundational classical and modern texts; major literary periods and traditions; major genres and literary forms; and non-canonical texts, including those of marginalized peoples and emergent cultures whose literature has traditionally been ignored. Demonstrate proficiency in essential, course-appropriate skills in reading, research, critical and creative problem solving, speaking, and writing in order to produce, within a literary genre, original work that demonstrates an understanding of both the writing process and the stylistic craft choices of the genre.